The Augur of Dunlain was formerly a Breton mage who lived and worked in the College of Winterhold. According to Tolfdir and Colette Marence, he was an upstanding mage and advanced student, especially talented in Restoration. Tolfdir will tell you, "He was a brilliant student, an accomplished wizard. Delved into magic in a way none had seen before. But, I think, he became too focused on just how much power he could acquire. That's what led to the accident." Apparently, it was this acquisition of power that distracted him from magical greatness. A failed magical experiment transformed him into a non-corporeal entity. Now referred to as the Augur, he resides beneath the College in the Midden Dark as a glowing ball of energy. He is sought after for advice during Good Intentions, and during Restoration Ritual Spell. During the Restoration Ritual, you must again find the Augur in his room in the Midden. He will give you a 'test', in which you have to survive the attack of three ghosts. Succeeding will pass the test and the Augur will tell you, "You are worthy, the knowledge is yours" and grant you the spell Bane of the Undead. "So you're the Augur of Dunlain?" "I am that which you have been seeking. Your efforts are in vain. It has already begun. But those who have sent you have not told you what they seek. What you seek." "I was told to find you." "And what is it I'm seeking?" "Indeed. And so you have come looking, though you do not know why. Like others before you, you blindly follow a path to your own destruction. 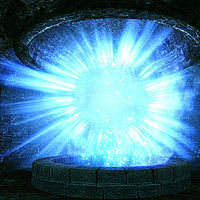 The Thalmor came seeking answers as well, unaware they will be his undoing. Your path now follows his, though you will arrive too late." "You seek that which all who wield magic seek. Knowledge. You shall find this: Knowledge will corrupt. It will destroy. It will consume. You seek meaning, shelter in Knowledge. You will not find it. The Thalmor sought the same thing, and it shall lead to his end as it has so many others." "Thalmor? What Thalmor?" "I'm not the first to come see you?" "The one who calls himself Ancano. He seeks information about the Eye, but what he will find shall be quite different. His path will cross yours in time, but first you must find that which you need." "No, though you may be the last. The one who calls himself Ancano has sought my knowledge as well, through very different questions. Your path differs from most. You are being guided, pushed towards something. It is a good path, one untraveled by many. It is a path that can save your College. I will tell you what you need to know to follow it further." "You, and those aiding you, wish to know more about the Eye of Magnus. You wish to avoid the disaster of which you are not yet aware. To see through Magnus' Eye without being blinded, you require his staff. Events now spiral quickly towards the inevitable center, so you must act with haste. Take this knowledge to your Arch-Mage." During Restoration Ritual Spell, the College's Restoration expert, Colette Marence, will fill you in on him: "The Augur was a brilliant mage. Truly inspired. Mastered spells others could barely comprehend. He was especially gifted when it came to Restoration. He's... Well, he's very particular about who shares the knowledge. So you'll need his approval first. Go on, go talk to him. I'm sure he's been paying attention, and will be expecting you." "Prepared for what?" "I'm ready for anything." "Colette has already told you. You must be tested before knowledge can be imparted to you." "Arrogance will serve you poorly. Your worth must be determined before knowledge can be bestowed upon you. And so you shall be tested." "You will rely on your skill as a mage. Not on your belongings, not on your scrolls and potions. Only what lies within. Survive, and you are worthy. This is the test put before you. Will you accept?" When asked what kind of a test this is, he will respond, "Knowledge is power. Knowing spells can be powerful, but applying that knowledge is key. You will be called upon to rely solely on your Restoration spells." If you walk away from him and speak to him again, he'll say, "The trial awaits. Are you now prepared?" Telling him you're ready will have him instruct you, "Step into the light, and your test begins." As you step into the light, all of your non-quest items will be taken from you. The Augur will summon ghosts who will attack you with weapons and Destruction spells. You cannot attack them; your only goal is to keep yourself alive using Restoration spells. If you are still alive by the time the test finishes, the Augur of Dunlain will tell you, "You are worthy. The knowledge is yours." as he returns your items and rewards you with the master Restoration spell Bane of the Undead. The Augur of Dunlain's toponymic surname points towards Dunlain Falls, a town near the border High Rock and Skyrim.